The other day, when a case for the Apple iPad Air 3 leaked along with some specs for the tablet, it sounded all too familiar. With cutouts for four speakers and the Smart Connector, the leaked image of the iPad Air 3 case was telling us that Apple's next flagship tablet is simply a smaller version of the Apple iPad Pro. Instead of a 12.9-inch screen, the iPad Air 3 carries a 9.7-inch display instead. 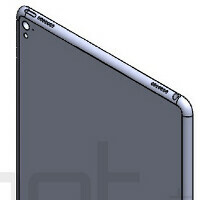 Other specs are said to match the business-centric iPad Pro including the use of the A9X chipset, and 4GB of RAM. There is speculation that the iPad Air 3 will support Apple Pencil, and will hook up with a smaller version of the Smart Keyboard. 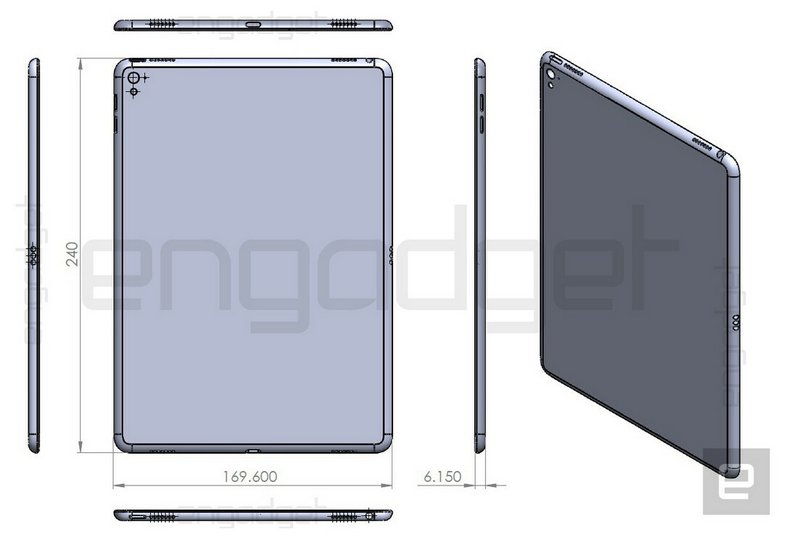 A drawing of the device that surfaced today allegedly reveals the dimensions of the iPad Air 3; the tablet will be 0.05 mm thicker and 0.1 mm wider than the Apple iPad Air 2. One piece of good news that we told you about yesterday, is that there is a cutout on the case for an LED flash. This is confirmed by the drawing which shows the flash under the camera. The inclusion of the flash would be a first for the iPad..
We should see the Apple iPad Pro mini Apple iPad Air 3 unveiled as soon as the middle of next month when Apple holds a rumored media event. Also believed to be introduced at the event is the 4-inch Apple iPhone 5se, and a refreshed version of the Apple Watch. Interesting. Assuming this gets Apple Pencil support and 4gigs of ram yada yada blablabla the it will also outsell the Surface Pro, just like the iPad Pro did, since more people are not into a 13" screen tablet. True! Th Pro was never built to overtake sale of the original though. It's the the plus of the tablet world. The 10 inch slate will be the dominate model. Do we have sales figures for the Surface Pro vs the iPad Pro? It was announced on Macrumors that the iPad Pro outsold the Surface Pro today. No way it did. You seriously trust a site like Macrumors with accurate info? Stupid 'tard. "Released in November, the iPad Pro sold more than 2 million units in the fourth quarter, while Microsoft sold about 1.6 million Surface devices, most of them being the high-end Surface Pro and not the entry-level Surface 3 device"
From the same study, they estimate 8.1 million detachables sales, that leaves 4.5 million for other brands, and we all know Android is not even competing in this segment (the same study again), so we can safely assume Windows is killing it in this segment and that the Surface is a successful idea and product. Toyota outsells Nissan, what's your point? That it's more popular. What is your point? OK, let's rephrase it so you'll understand: Toyota outsells Tesla. Get it now? All this jibber jabber lol. At the end of the day, the iPad Pro is still an iPad, with amazing artistry capabilities, as what is designed for - media and art; while the Surface is an overpriced cheaply made laptop, with a touch screen that barely has any apps, and which also has millions of websites and programs (computer) that don't work well with touch, let alone are meant to be used with a finger/stylus. You're looking at this from the complete opposite angle lol. By the way, about Samsung.. Overall, Apple was the top tablet vendor for the fourth quarter, with 16.1 million units shipped, although that represented a decline of nearly 25 percent. Apple’s result compared with 9.0 million units shipped by Samsung during the quarter, which was a decline of more than 18 percent. What does this say? We all know the tablet market is sloping. Overpriced cheaply made? Is that what Apple is too? Barely has any apps? Yes. But programs, no. Surface is a revolution ahead of iPad pro. Think of it, it's just an oversized iPod touch with a overrated pencil. Simply, you can do more with Surface. And the surface as I said is an overpriced piece of plastic compared to the potential you could get for the same cost in a different product (different, better, laptop, to spell it out for you). If you cant buy it dont talk sheet about it. Jeez, poor people. As if iPad pro is not overpriced,and then you buy separately THE pencil. All of those "programs" are bloated legacy programs that don't work well with touch input. What's the use? You can get better tablets with more touch-centric apps for less money and you can get better laptops for less money. I guess getting a half-assed tablet/laptop hybrid that is not good at either must make sense in Bizarro Windows World. I dont see Ms Office apps, Photoshop, Lightroom, AUTOCACDD, Edge and Metro not being touch friendly. Stop comparing iOS apps to lib apps. iPad pro just borrows apps optimised from iPhones. You get blown up resized versions buttons get larger thus illusion of touch opmitized. Can you come up apps designed for the iPad pro? You only get a handful. There are more iPad-specific apps (725,00+) than there are Windows apps (Windows and Windows Phone), period, full stop. Yes, but which ones aren't shovel ware? The last time I relied on a mobile app over a Windows one was never. Amplifying audio on 4 sides. Very nice. You are on point. I can't see iOS bogging down this much power. My iPad Pro hasn't stuttered once. My iPad 2 has slowed down considerably. but still fairly good considering its age. You're right, I exaggerated. Mine has slowed down, but is still awesomely smooth, considering its age like you said. Looks like darkjeddi doesn't have to wait for 2 years to get his hands on an ipad pro. Will replace my Air 2 for sure.